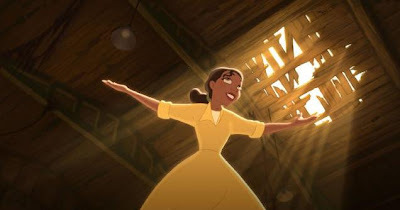 I can say Tiana is the most unique princess, not because she has the most different color of skin, but because she really has the most different character. The most unique thing about Tiana is, she's really a hard-working person. When she wants something, she will do everything, pay everything, even sacrifise everything to achieve her dream. Maybe I can say she's stubborn. She won't listen to you when you give advice to her. But, from different perspective, I can say she has a super strong conviction. Well, at least that's a good point. Tiana is a focused person. So far, she's the most focused Disney character I know. When she wants to go "somewhere", her way is totally focused, straightly from the point where she is to the point where she wants to be. You can try to change her way. But when she says she must go to "that place", she won't care anything unless it can bring her to "that place". In the end of the story, somebody finally could change her mind. A frog, well, cursed prince I mean, named Naveen met Tiana and had a long journey with her. From that journey, Tiana learned lots of things, until she realized she just can't focus on that one thing only. She needed something else. It's not because that one thing was wrong, But she learned, when she focused on that one thing, it didn't mean she should ignore other thing. In this case, Tiana focused too much on her dream to make a restaurant. It was really her dream. Her mom told her that she worked too hard, but she didn't care. She felt like she knew everything she wanted, and she would do anything to get that thing. I'm sure it was not easy to change Tiana. She was always strong with her conviction at the first time. But, because an unexpected thing happened and she had no choice, she finally had to change her plan for a while. In that time, she realized restaurant wasn't only one thing she should reach. She needed love. I learned from her. Sometimes we focus too much on one thing until we forget other things which maybe as important as that 'one thing', or maybe more important than that. In Tiana's story, she focused too much on her dream until she forgot about love. It may not always be your dream. It may be the opposite, you focus too much on your love, until you forget about thing you need to achieve in future? The point is, whatever it is that we focus on, keep being open-minded! Sometimes we can't see other thing that may be better than what we focus today, because we focus too much on it. It's good to be focused and organized. But, when you're too focused on one thing, it's like you don't care about other things. The fact is, what you focus on isn't always the most important or the best thing. It's like you decide to be a close-minded person who doesn't want to know any other thing, because you feel like you know everything you want and everything you need. Well, what you think it's good isn't always the best. What you think it's important isn't always the most important. What you think it's right isn't always right. Sometimes you need to be open-minded, to see that life offers many things you may not realize before. Like the song from this movie, maybe you just need to find "the best thing you never knew you needed". If you focus too much, you won't know it until the end. Too much focus on one thing makes you can't see other things, which may be better than that 'one thing'. My favorite princess is Cinderella. She believed in dreams, all right, but she also believed in doing something about them. When Prince Charming didn't come along, Cinderella went over to the palace and got him. Nice reflection indeed :) I like the last quotation..
And btw, honestly, your writing abt Tiana inspires me.. I love Mulan...she's my favorite Disney Princess....followed by Rapunzel, Aurora, Jasmine and Ariel.. I really like your perspective on the new DP. My favorite princess is Jasmine. She did not only want freedom and independence, but true love as well. I love ketek ogleng, can you write about him? please?